Well, the blog is of enormous value and the book is bound to be as well. Its good news that it will not be just chronology. It sounds like it will be a challenge to future historians to rethink how they handle fraternal history. 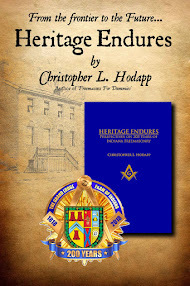 Brother Chris, can you please let me know with whom I might speak regarding the armorial bearings used for the Grand Lodge of Indiana? I see they are used above in the commemorative logo. 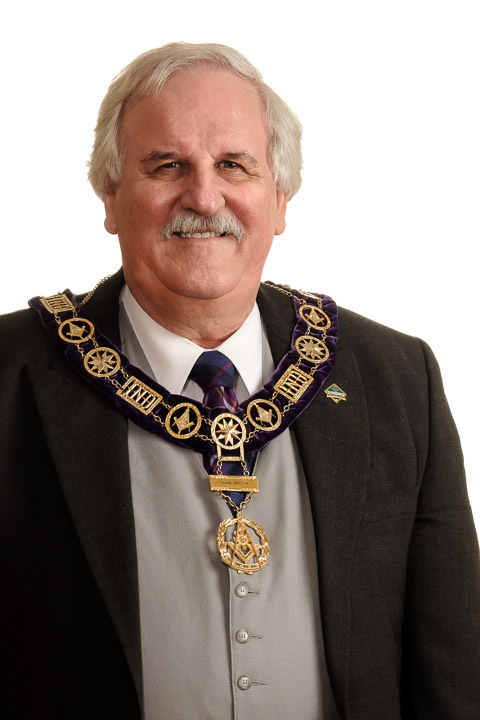 Tthe Grand Lodge’s herald of arms was originally designed by PGM Dwight L. Smith in 1977. 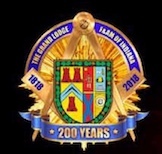 While thousands of Indiana Masons see this herald each year, few realize that it is bursting with rich symbolism that depicts Indiana’s historical Masonic origins. According to Smith’s original notes, the arms are portrayed on a shield with a border of leaves and blossoms of the tulip tree, the official tree of the State of Indiana. On the left of the shield are three castles and a chevron with an open compass. These are all derived from the arms of the United Grand Lodge of England, which were adapted from the original arms of the operative London Company of Free-Masons in 1472. On the right half of the shield, the four panels illustrate the Masonic genealogical lines from England to the American colonies, and onward to Indiana: the St. Andrew’s cross from the arms of the Grand Lodge of Scotland; the effulgent sun, from the seal of the Grand Lodge of Pennsylvania; an American Indian and a star, from the seal of the Grand Lodge of Massachusetts; and the beehive, plumb, gauge, and level, from the seal of the Grand Lodge of Virginia. This single symbol traces how Freemasonry came to Indiana – from England to Pennsylvania, then to Ohio and Indiana; from England and Scotland to Massachusetts, then to Connecticut, New Jersey, Ohio and Indiana; from England and Scotland to Virginia, then to Kentucky and Indiana. 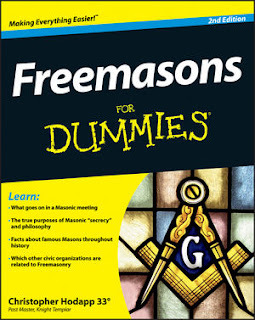 Thanks for all you give to Freemasonry!